ONE of the most successful two-wheelers ever produced must surely be the Honda Fifty. In the face of this high standard, how does the new 87 cc C200 measure up to its smaller brother? Good use has been made of the extra 38 cc, not by increasing top speed, but by giving better acceleration and greater punch throughout the range. Briefly, the C200 is a delightful little machine. It is smart, agile, easy to ride and utterly reliable. Starting was first time every time, although it was necessary to open the air slide very gradually during the first mile to keep the engine from dying. This, of course, was much more apparent in cold weather when it was easy to stall the engine before it got really warm. A typical four-stroke single, the power unit idled with grandfather-clock precision and an almost inaudible wooffle was all that could be heard. At all speeds the exhaust note was subdued in the extreme. 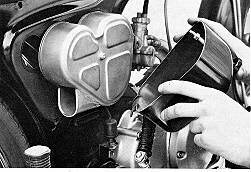 Mechanical noise, too, was unobtrusive; the all-iron barrel and cylinder head help to keep the noise level low. Action of the engine-speed clutch on the test model was below par in that the drive was taken up very suddenly . Although an experienced rider would get used to this very quickly it could be unsatisfactory for a learner. Gear changing, up or down, was normally attended by a slight clonk. This discouraged fast changes; but the C200 make no pretensions to being a sportster. The engine would buzz to peak revs smoothly and with complete lack of fuss and at normal cruising speeds - 45 to 48 mph - power delivery was notably sweet and effortless. Although the Ninety is no faster than the sports 50 cc model, it has a great deal more punch, In fact, it could easily be mistaken for a one-two-five - except, perhaps, on the score of fuel consumption which, at 175 mpg when riding at a steady 30 mph, was almost unbelievably good. The above-average acceleration in city traffic confirmed the impression that the machine is ahead of its size in performance. The Ninety was extremely comfortable. It was pleasant to have such a convenient sit-up-and-beg riding position. All the controls are handy, positive and light in operation and the clutch is especially light. Such a combination of comfortable riding position and well-behaved engine made the bike a rare pleasure in traffic; it was just about as manoeuvrable as a two-wheeler could possibly be. Unlike some rocking gear pedals designed for contortionists with big feet, the Japanese versions always seem to be made with the average foot and ankle joint in mind - and this goes for the C200. Another Japanese knack is in realizing that people who buy lightweights are not all endowed with luxurious personal padding; they put the sponge in the bike's seat instead! Handling suffers from excessive, bouncy suspension movement on uneven roads. The reason is that neither suspension is sufficiently damped, the bigger culprits being the rear units. It was not too bad solo, but the combination of a 13 stone passenger and bumpy corners taken enthusiastically caused the rear end to step out of line occasionally. It is, of course, easy to be hypercritical of handling without realizing that the C200 should be judged as a touring lightweight, not as a race-bred sportster. However, apart from this lack of damping, the suspension was just about right - not too soft as is sometimes the case with Japanese machines. The brakes were adequate although the front one in particular tended to be a little spongy in action. Fullest marks are due for the electrics. They are up to the usual excellent Honda standard. Equipment includes a neutral-indicator light, flashing indicators, speedometer light, stop light, pilot light and amply powerful main beam. Flashing indicator switch operation was positive. The C200 is an impressive machine. Plenty of power, good cruising speed, ultra economy and complete oil tightness, As Which? might say, a good buy. 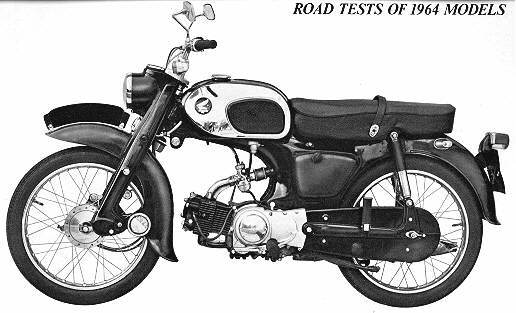 ROAD TEST BREIF SPECIFICATION Engine: Honda 87 cc (49 x 46 mm) ohv single. Carburation: Keihin PWI8HA with direct shutter for cold starting. Electrical Equipment: AC generator, Coil ignition with six-amp-hour betted charged through selenium rectifier, Approximately 5 1/2in diameter headlamp with 25/25-watt main bulb; flashing indicators; neutral indicator light. Transmission: Four-speed gear box in unit with ending; rocking-pedal foot control, Gear ratios: bottom, 25.2; second, 16', third, 11 .8: top, 9.51 to 1. Multi-plate clutch, Primary drive by spur gears, Rear chain enclosed in pressed-steel case. Engine rpm at 30 in top gear, 4,400. Tares: Nitto 2.50 x 17 in front and rear. 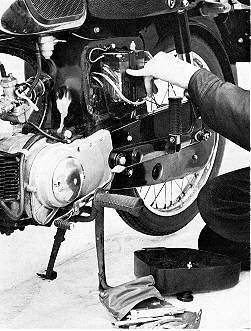 Brakes: Approximately 5 P'a in diameter, front and rear, with finger adjustors. Suspension: Hydraulically damped pivoted front and rear forks. Dimensions: Wheelbase, 47 in, Ground clearance, 7 in, Seat height, 30 in, All unladen. Weight: 115lb fully equipped and with approximately one gallon of petrol. Maximum Speed: 53 mph (with following wind) 51 mph (average of runs in both directions). Acceleration: Quarter-mile from rest, 29 seconds with a terminal speed of 48 mph (average of runs in opposite directions). Fuel Used: 175 mpg at 30 mph: 112 mpg at 40 mph. Braking: 37ft from 30 mph (surface, dry tarmac).